The AccuMassage Trigger Point Tool is a self care must have. We have a new favorite tool at our WholeFrog clinics and it’s quickly becoming a client must have. Almost everyone has a spot they can’t quite reach on their own, or that they beg someone to dig into. If you can relate to this, the accumassager is the tool to have. First of all, it’s incredibly easy to use. The tool features two rubber ‘golf balls’ and a flexible rod with two handles. All of the pieces come apart for easy portability so you can take it with you everywhere. This self care machine will quickly become your secret weapon against headaches, neck pain, shoulder pain and more. It grips into your areas of tension and feels a m a z i n g!! Runners can finally get relief on their calves, tight hamstrings and feet. As you pull in the handles, the massage balls apply the desired pressure to the affected areas to release tight and contracted muscles which can contribute to muscle spasms, headaches and migraines. One of my favorite uses is releasing the fascia in the shoulder area, that knot that comes from too much time spent hunched over a computer or phone. 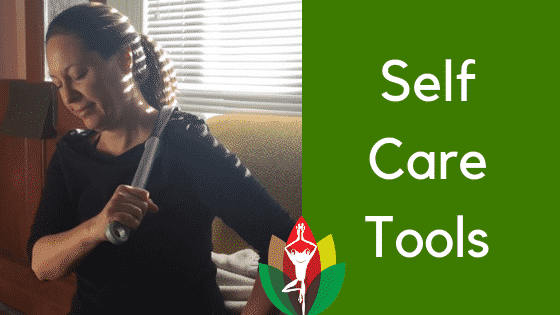 When you use this self care tool, the fascia starts to let go and the pain is free. When you can’t get in to get a massage, this is a great alternative. Recommended by doctors, chiropractors, physical therapists and massage therapists. You will love how quickly your muscles release. Relieves headache and neck pain instantly! The best myofascial release tool ever! Anyone who works on the computer should own one of these. Can use anywhere on the body.